When I want to buy new supplies, I go digging all over the web for advice from other artists on what works best for them. 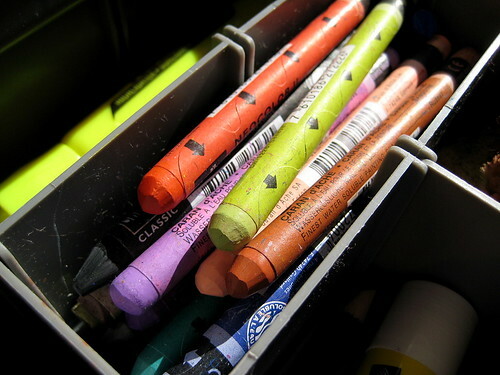 There is generally a consistent line pointing towards the more expensive products but I don't always have the money to buy a full set of colored pencils or watercolors. The biggest piece of advice I can offer you when shopping for new supplies is buy open stock whenever possible. Open stock means materials that are sold by the piece rather than by the set. Large chain art supply stores like Blick (Blick online as well) and some craft stores like Michael's/AC Moore sell products by the piece. My suggestion is to buy a few of your desired product in the colors you know you will use. I can't tell you how much product I have in browns, & greens I never use. You might end up spending a little more in the long run, but it's better to try before you spend the $$$ on a larger set without knowing whether or not you will like using that product. 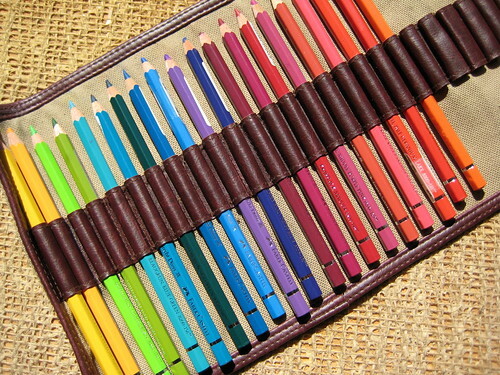 I finally got smart when I bought these Albrecht Durer Watercolor Pencils. I bought the individual colors I wanted and loved them, then I went back and bought a few more to round out my own personal color pallette and I didn't have to spend money on colors I wasn't going to use. The other day I learned a good friend of mine's mother had passed away. Before I had the chance to speak to her, (and feeling quite concerned about her) I sat down and created this piece entitled "Release" while holding her in my thoughts. The image was created by painting with frisket (a masking substance) on extra rough Clairefontaine watercolor paper. I then applied 4 different colors of fountain pen ink over the frisket, (Herbin's Bleu Azur, Diamine's Imperial Blue, Indigo & one of their black inks - I forget which) Once dry, I removed the frisket and then started filling in the empty spaces using .5 and brush nibbed Copic Multiliner markers. This piece ended up one of my most favorites, ever. This first image was done on one of the final pages of a pad of Strathmore Artagain paper. It's not my favorite black paper, (Canson's Mi- Teintes is) because the surface is too smooth. These next 4 mandalas were done in a Strathmore field book with black pages. (I found it at Michael's) The paper is still too smooth for my tastes, but I like that it's spiral and that I can fold the cover back on itself. What I really need to do is have someone make me a book out of the Mi- Teintes paper. 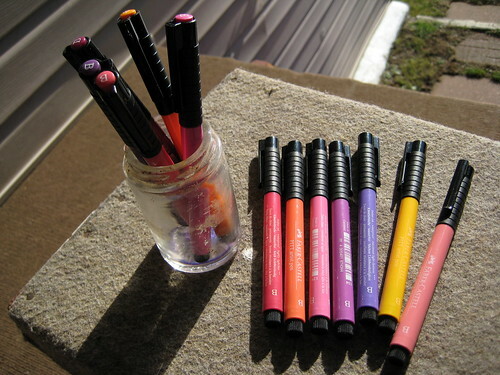 The silver gel pens are various brands that I bought from Jetpens. They have a great selection of silver & white pens great for this purpose. Jetpens also has a great comparison article about their different white pens. My new Gorillapod Flexible Tripod showed up the other day and I immediately put it to use with my Canon SD1000 Elph. The Gorillapod legs are flexible in a multitude of ways so I wrapped them around the handle of my refrigerator and pointed the camera down onto my sketchbook. My Elph has a Time Lapse video feature and I believe I had it set to record at 1 second intervals. 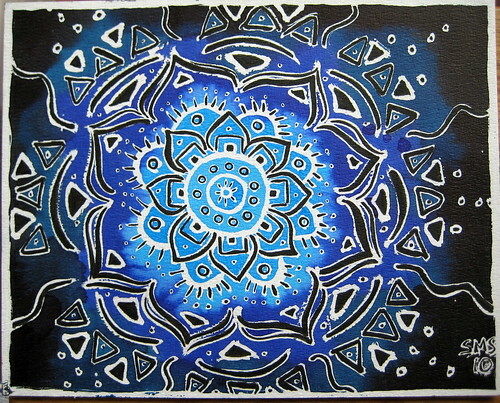 I'm not sure how long it took me to doodle this mandala - 12 minutes maybe? The video was very short and once I puled it into Corel VideoStudio 12, I first rotated it 180 degrees and then slowed down the video so it would play for 1 full minute. I tweaked the lighting settings a bit, added music & voila! My first time lapse mandala video. The only real issue I had is that I don't really ever draw at arms length or on a table. I'm nearsighted and I'm usually holding the book about 8" away from my face when I draw so this was a bit of a challenge. If I can figure out a way to get the camera looking over my shoulder I'll shoot one with the book in my hand. Supplies used were a Tombow calligraphy pen from JetPens & a Clairefontaine sketch book.